Already out in Yukon and Tahoe SUVs, the two-mode hybrid was developed in a joint venture with Chrysler and BMW. The idea came about as a scaled-down version of GM’s hybrid bus drive train and is especially well-suited to vehicles that need some towing and hauling capability. The system is distinct from most other hybrid systems because it can automatically run on straight mechanical power as well as pure electric or a combination of the two. 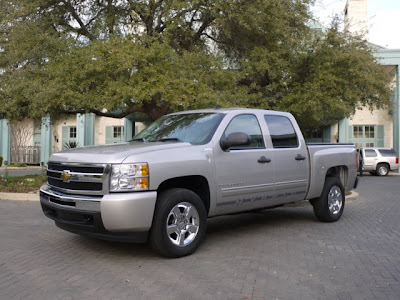 Based on the reengineered Sierra and Silverado pickups that debuted in 2007, the hybrids look the same as the crew cab versions of the base trucks with the exception of some hybrid badges, optional hybrid graphics and a standard tonneau cover that helps out aerodynamics. The battery pack is underneath the rear seat, and the hybrid drive unit is about the same size as the transmission it replaces. It contains two compact electric motors (one reverses field to generate power) and four mechanical gears. The two-mode hybrid system sees the most advantage in city driving, so GM planned an all-city driving route as the first demonstration for the press. 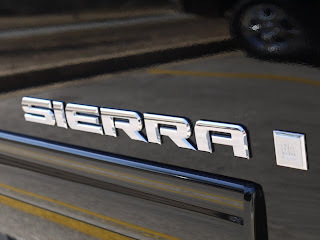 Starting off in a four-wheel-drive Sierra rated at 20 mpg n in both city and highway driving, I clocked an indicated average of 22.3 mpg over approximately 75 minutes of driving. 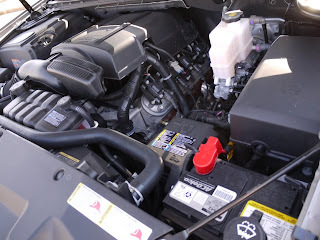 Like other hybrids, the engine shuts off when the vehicle is stopped so as not to idle unnecessarily. 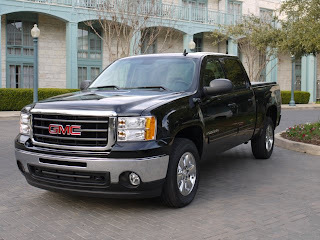 When you start moving again, the hybrid pickups are capable of driving up to a stated 30 mph on electric power alone. The gasoline engine starts up automatically and seamlessly when it is needed. 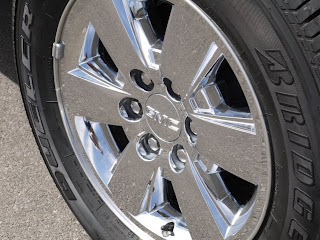 As I had experienced previously in a GMC Yukon hybrid, it was difficult to start moving at a normal rate without the engine kicking in. However, once it was rolling with a steady throttle input, the engine would turn off and we were able to run up to around 28 mph on electric power for a quarter mile or so at a time. Above that, engine power would do the driving duties. Ideally, at the 35 mph cruising speeds we were getting, the truck would run on hybrid power, a combination of gas engine and electric drive, but this seemed hard to maintain unless we were on a longer stretch at steady speed. When you back off the accelerator and coast, the batteries start recharging. The 6.0-liter V-8 engine will also automatically cruise in four-cylinder mode for extra fuel savings. Next, two Sierra and Silverado hybrids were hooked to trailers and others were loaded with 800 pounds in their beds. We took a drive towing a 5,400-pound Sea Ray boat with inertia brakes on the trailer. The hybrid was able to pull the boat in electric mode up to 15 mph. When briskly accelerating from a stop, the hybrid felt especially potent. 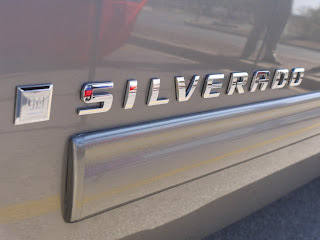 The Silverado and Sierra hybrids do deliver as promised, and the hybrid drive functions in a silent, seamless manner. However, their advantage can only be used to its full potential in a fairly narrow set of circumstances. 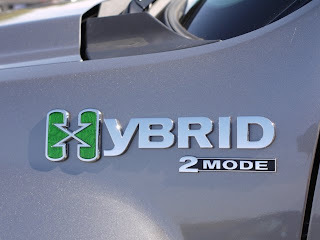 Extensive city driving, perhaps as a delivery truck or a longer stop-and-go commute are some areas where the hybrids would excel in efficiency. 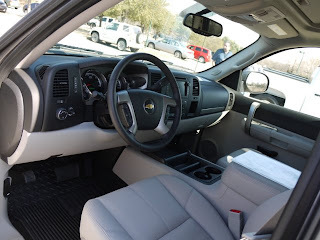 On short trips, especially in cold weather, you won’t see any savings over a similar gas-only pickup with cylinder deactivation, as the engine must be fully warmed up before the hybrid drive starts functioning. 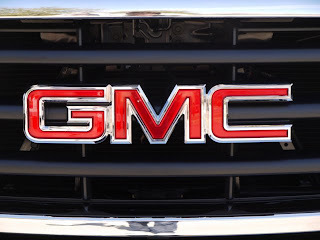 Yukon and Tahoe hybrid SUVs hit the market last year only fully loaded at upper-end sticker prices; GM has made the price of admission for the pickups more affordable with a decently equipped package starting at $38,995, including destination. Probably not low enough to save money in the long run at today’s gas prices, but it’s still a compelling product and an impressive engineering achievement.